This is a follow-up to the post I wrote last year with a lot of new information I learned from my last two climbs. Be sure to read the original post first to get a good overview about the mountain and the route. 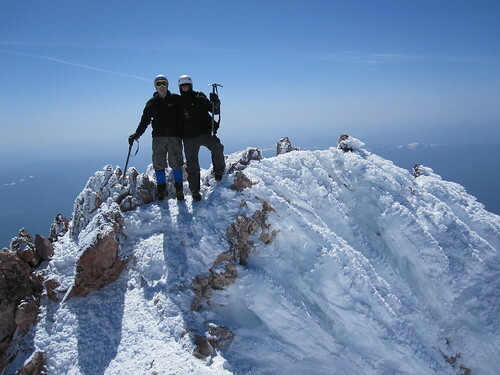 My plan was to attempt to climb Shasta twice in one week in May, with a few days in between to recover. It didn’t go entirely as well as I had planned, but I did learn a lot. Here’s how both trips went. UPDATE: I’ve written a follow-up post which contains a lot of new information and how my two 2009 trips went. As 2009 rolled around I decided that this would be a great year to go backpacking up Mount Shasta again. I have attempted the mountain twice in the past and topped out (i.e. reached the summit) once. This year I’m organizing a group trip, which is why I’ve started planning so early and the reason for this post. Here I will outline my experience with the mountain and what to expect. I just saw this video and it’s a really inspiring visualization of the web, semantic HTML and how it has connected the world. Makes me want to go out and compile some mashups! Enjoy.